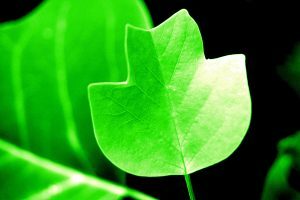 Have you ever wondered why plants are green instead of blue or purple? It’s because they are chock full of chlorophyll. Plants use the pigment chlorophyll to absorb the solar energy they need to perform photosynthesis, converting carbon dioxide and water into sugar (glucose) and oxygen. Chlorophyll appears green to our eyes because most of the light it absorbs is blue and red, leaving behind the rest of the spectrum, which averages out to green. The reason chlorophyll absorbs blue and red light is because very specific energy wavelengths are used to break the bonds in molecules used to perform photosynthesis. The molecule makes the most efficient use of the energy provided to it by absorbing only the wavelengths it needs. There are, however, other pigment molecules in plant cells that do absorb green. For example, some carotenoids appear red to our eye because they absorb green. Most of the time, a plant appears green rather than another color because there is so much more chlorophyll compared with the amount of other pigments. You can see some of the other colors when plants stop producing chlorophyll in the fall.